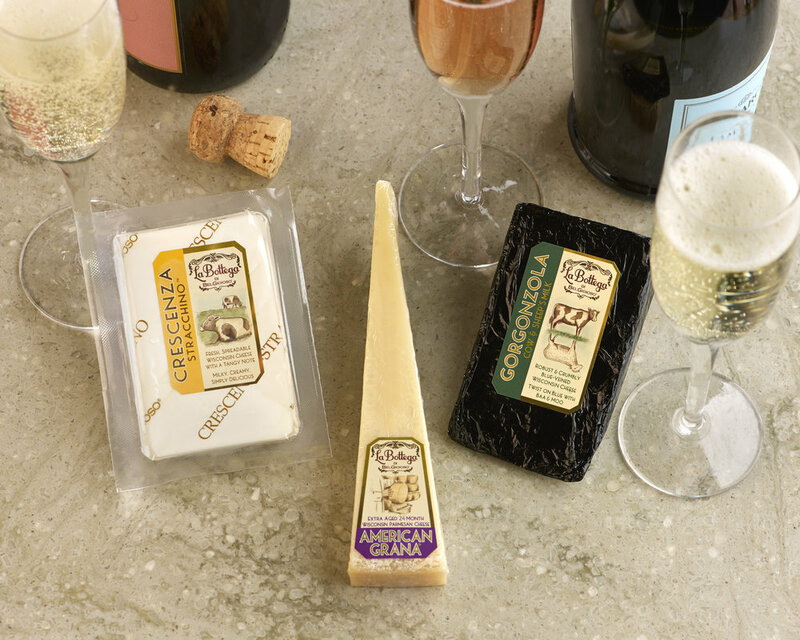 Ring in the New Year with well-matched bubbly and artisanal cheeses. New Year’s Eve is the ideal time to pop open a bottle of bubbly and celebrate with your loved ones. It gets even better when you add a selection of handcrafted, La Bottega di BelGioioso cheeses. These champagne and cheese pairings will delight your palate and help you ring in the New Year in style. Sparkling rosé wines are typically thought of as summer staples, but their juicy, fruit-forward flavors make for a perfect New Year’s Eve toast as well. For an elegant pairing with a dry, crisp sparkling brut rosé, look no further than La Bottega di BelGioioso’s American Grana® Extra Aged Parmesan. The nutty notes in this award-winning cheese expertly complement the fruit flavors of the rosé, creating a festive match that is worthy of the occasion. Drop a frozen grape in your champagne glass for an extra burst of fruitiness at the end. Napa Valley’s Schramsberg Vineyards produces an outstanding sparkling brut rosé that is moderately priced and available at wine shops throughout the country. Whether it’s in the form of sweet and sour chicken from your local Chinese takeout restaurant or roasted vegetables agrodolce, there’s no denying that sweetness and tanginess make beautiful music together. And so it goes with demi-sec champagne and Crescenza. This fresh, spreadable cheese lends a mild tanginess that balances the residual sweetness that is the hallmark of an excellent demi-sec champagne. Veuve Clicquot, one of the most celebrated champagne makers in France, creates a beautiful interpretation of demi-sec that will be a holiday treat to remember. The La Bottega di BelGioioso 90-day aged Gorgonzola cheese delivers incredible flavor through its mixture of cow’s and sheep’s milk and its distinctive, earthy blue veins. It deserves champagne that can match it, which is why a classic extra-dry makes for the perfect companion. The unique balance between dryness and sweetness slightly mellows the inherent pungency of this iconic blue cheese. California winemaker Korbel features a highly-rated extra-dry sparkling wine that is value-priced and right at home at any year-end celebration. We’ve only scratched the surface on delectable champagne and cheese pairings. Register on Facebook to win two holiday cheeseboards by 12/31/16 to receive our free downloadable La Bottega Holiday Guide with more cheese pairings. For more innovative ways to entertain with cheese throughout the year, visit our blog at savorlabottega.com/blog/.